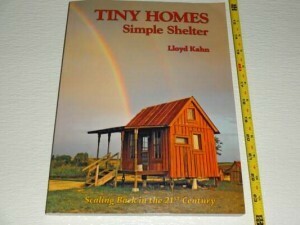 I am reviewing the book Tiny Homes Simple Shelter written by Lloyd Kahn and published by Shelter Publications. I love this book. It is truly beautiful to look at with 1300 photos. It is like eye candy for folks that like to look at or are thinking of building, buying or living in a tiny home.There are over 150 builders in the book with their tiny home creations. Some are on land and some are on water. There are plenty on wheels for folks that wish to be able to take their tiny home with them. Made from pretty much every kind of material there is, from cob houses to straw bale. Every kind of home from boat house to tree house. There are yurts,vardos and beach shanties.The book is just enthralling and I really have to say it is a book you will want to share. The title is Tiny Homes but the book is anything but tiny. It is a full foot long and 9 inches wide so it will be perfect on your coffee table to share with guests. I love all the pictures and the stories that go along with them. Each home comes with the story of how it came to be home to its builder. Scaling back and living a simpler life is very much on folks minds these days. A lot of folks want to live in tiny homes, others just want one they can take with them and still others are looking for ways to make room for parents, adult children and inlaws in todays economy. There truly is something in this book for everyone. Some are built from kits while others are built from salvaged material. If you have a longing to live in a tiny home or just enjoy seeing how others do live in them, then you will enjoy this book as much as I am. Each of these are under 500 square feet but totally full of charm. The pictures are great and the stories just icing on the cake. This book is a treasure and I am so glad I have a copy. Get one for yourself or give one to someone that is fascinated with Tiny Homes. WINNERS – Did you win ?